Shopping for Nightmare Before Christmas Action Figures? Take a look at our huge selection of Pop! Vinyl Figures, Action Figures, Statues, Mini-Figures, Construction Toys, and Dolls! Jack is back! 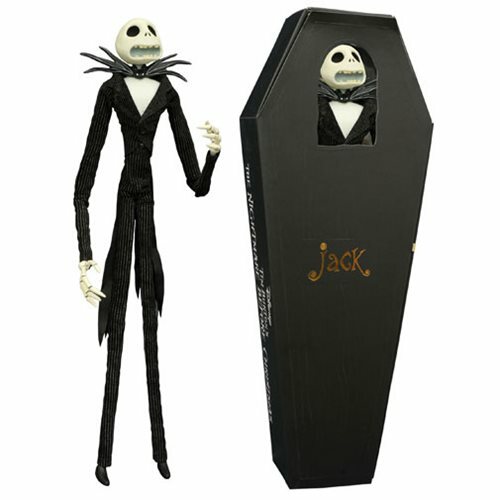 The Jack Skellington Coffin Action Figure features the Nightmare Before Christmas star with a variant facial expression, updated coffin, and the same real clothes and poseable skeleton body! Measuring approximately 16 inches tall, this doll looks like it just stepped off the big screen – and into a coffin! Packaged in a quality cardstock coffin, this doll includes a display stand. Ages 8 and up.